Our research into nature connectedness has been named by Universities UK as one of the UK’s 100 best breakthroughs for its impact. Central to that impact has been our pathways to nature connectedness. In May 2017 our pathways to nature connectedness were published in the journal Plos One. 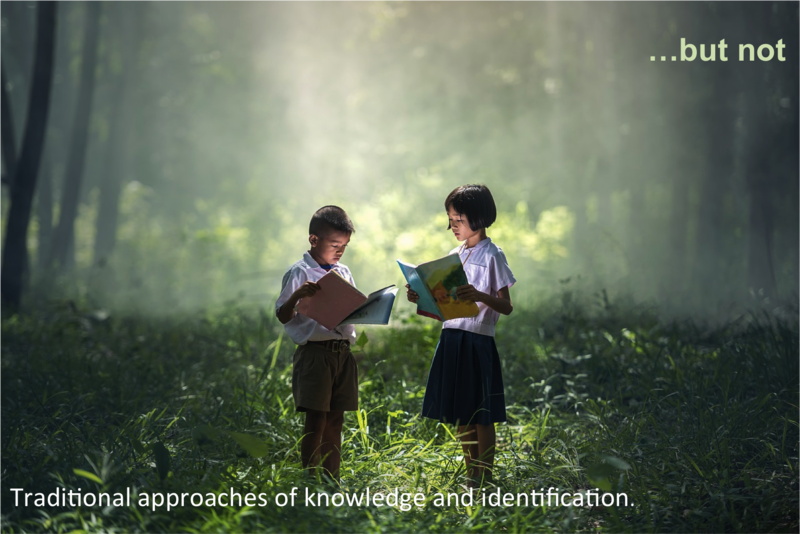 The paper outlined the key findings from 3 years of research into the types of activities that lead to nature connectedness – the measurable psychological construct associated with human well-being and pro-nature behaviours. 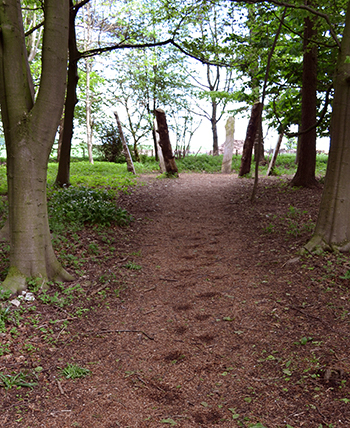 This blog tells the story of the application of the pathways, firstly with the Wildlife Trusts, then the National Trust and others. The four types of relationship that weren’t significant were fear of nature, dominionistic, utilitarian and scientific. 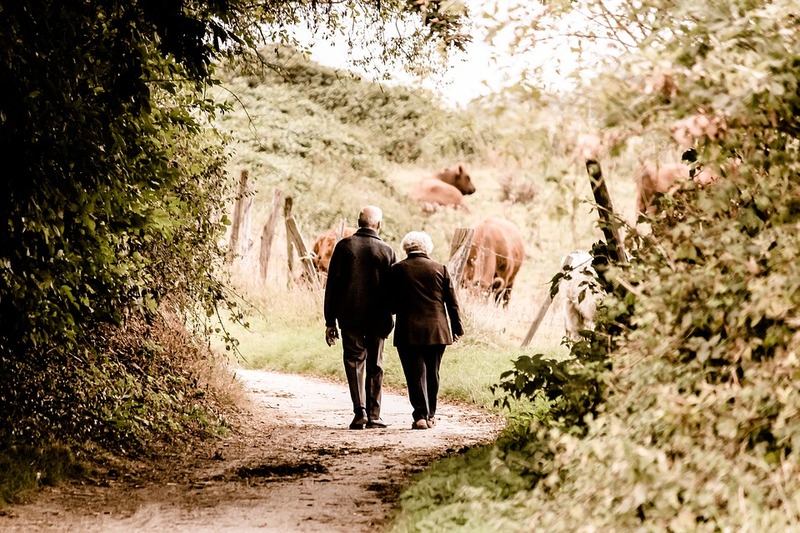 These types of relationship are common, they can be seen as pathways for survival and progress that, unchecked, have led to nature’s decline – with the massive decline in wildlife and climate change it’s clear that the current human relationship with (the rest of) nature has failed. There is an urgent need for a new relationship, yet much engagement still promotes some of these types of relationship, nature as a resource, conquering challenges in nature and nature as facts and figures. The first application of the pathways came while still conducting the research. 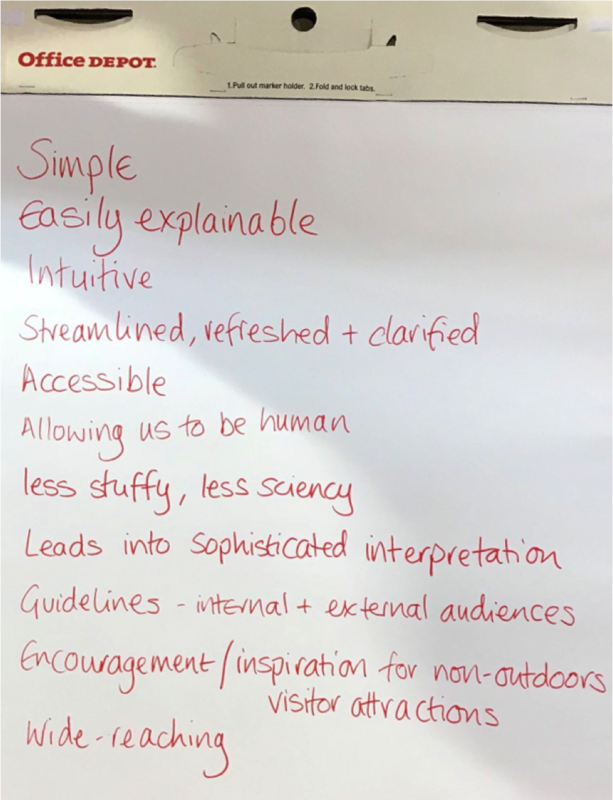 We were talking to The Wildlife Trusts about their new 30 Days Wild campaign and we applied the pathways in order to review the long list of activities – or random acts of wildness. We highlighted the knowledge based activities and suggested occasions when the activity could be framed differently, by noticing the beauty of nature for example. 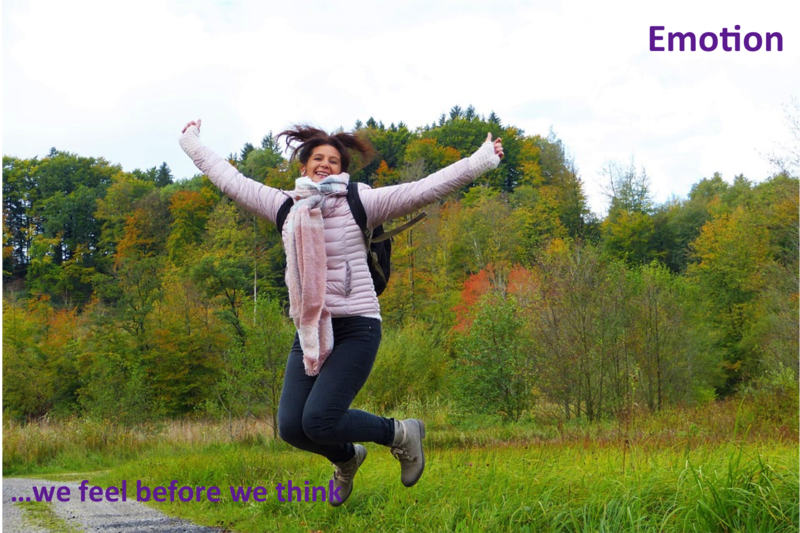 Taking part in 30 Days Wild has repeatedly (see papers on the results from 2015, 2016 and 2017) been found to increase nature connectedness, wellbeing and conservation behaviours for the 100,000 plus people taking part. 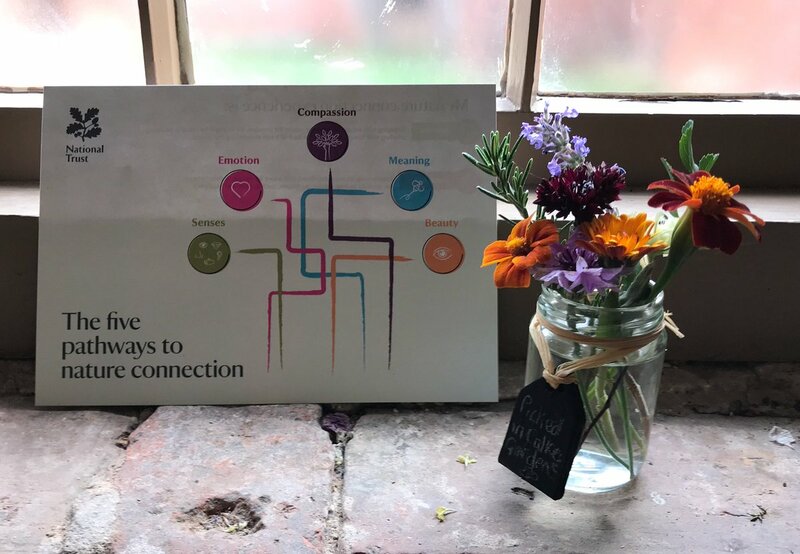 A year or so ago the National Trust adopted the pathways as a framework they could apply to the design of visitor experience activities and programmes in order to improve nature connectedness – to foster a closer relationship with nature for both human and nature’s well-being. In a fascinating year I’ve been working closely with the National Trust to help roll the pathways out across various parts of the organisation. I’ve also been introducing the pathways to other conservation organisations Recently I’ve presented the pathways to other conservation organisations (RSPB, Plantlife, Bumblee Conservation Trust, Buglife and Butterfly Conservation) to help inform their engagement work. 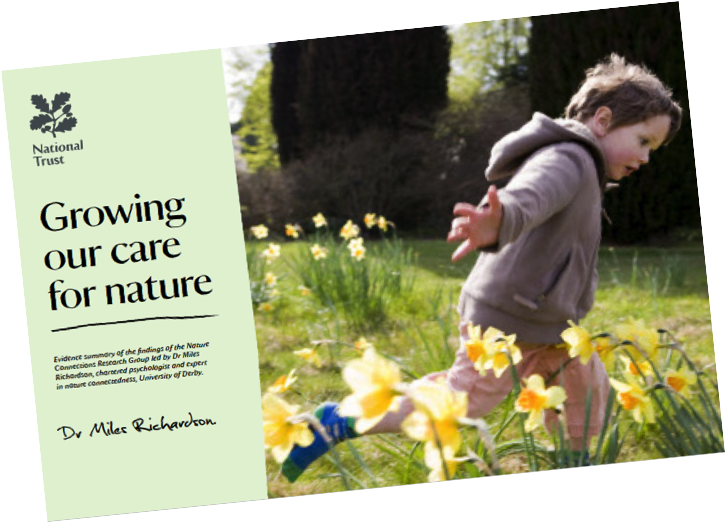 The first step in our work with the National Trust was an internal report introducing the evidence of the benefits of nature connectedness and the pathways. A series of workshops with the people who develop and manage the visitor experience then took place, facilitated by videos and brief guidance on the pathways. 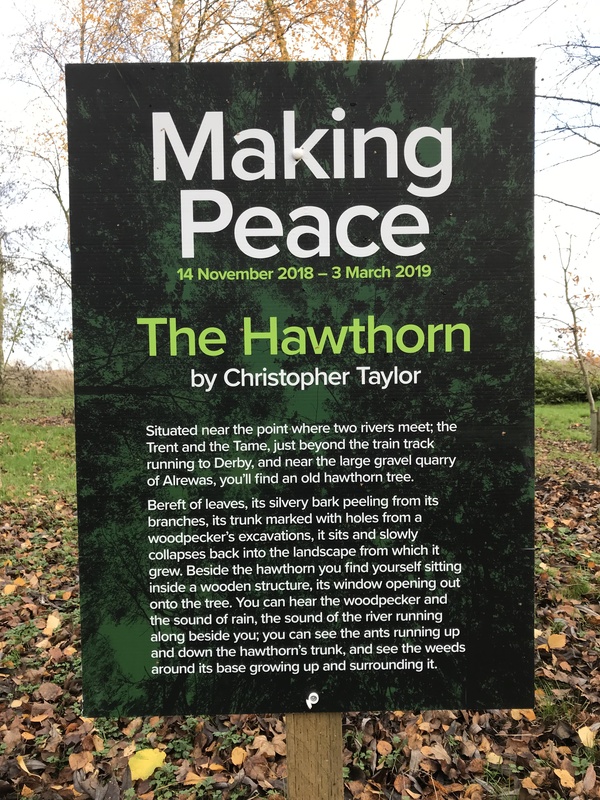 It’s been fascinating introducing the pathways and discussing them with a new audience, an audience with expertise in engaging people with nature. The feedback has been overwhelmingly positive, how the pathways can help tweak existing activities or inspire new ideas. Taking the focus away from knowledge and identification, although challenging for some, has been widely embraced – for example giving people a ‘licence to talk about emotions’. An example of feedback on the pathways can be seen below. 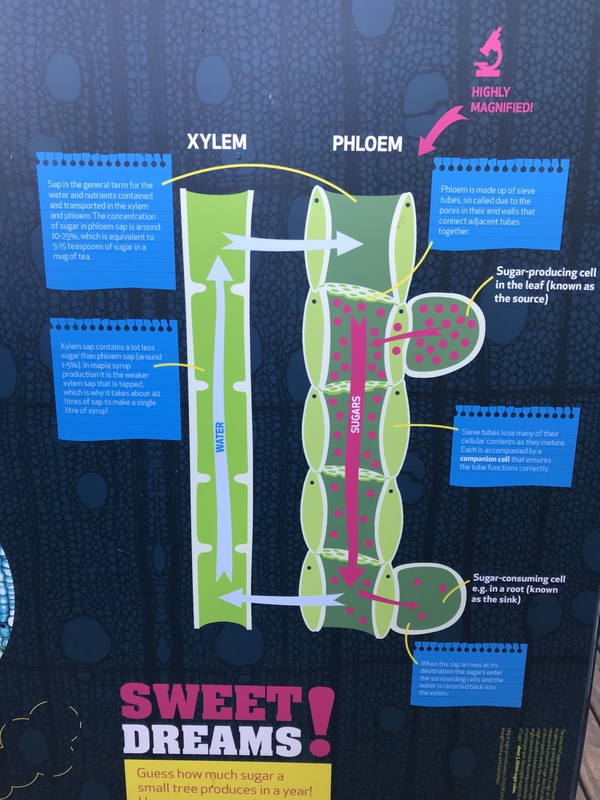 So, let’s look at the pathways in more detail. Senses – once you’re out in nature this is unavoidable, but prompting moments to pause and notice is essential, the simple things like listening to birdsong and smelling wild flowers, touch the bark, smell the pine needles, listen to the wind through the leaves. 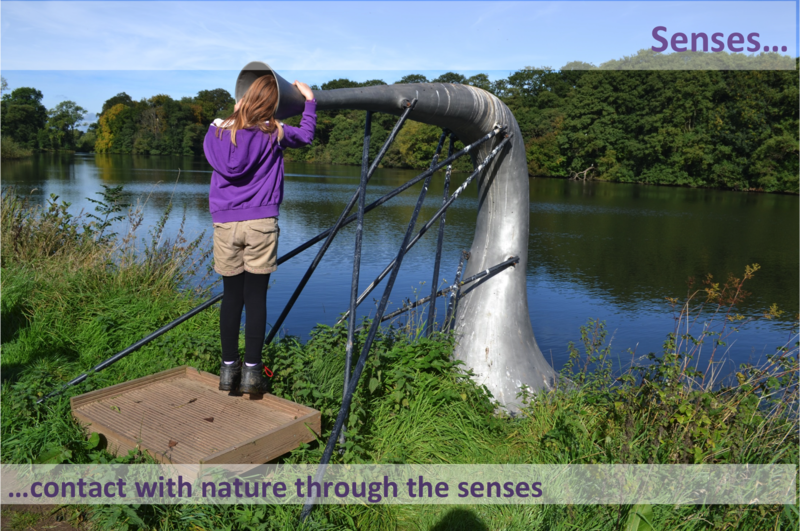 It’s also possible to prompt such engagement through arts installations, such as the giant ear-trumpet above picking up the sound from the surface of a lake – these ‘habitats for connection’, afford engagement. Emotion – Fostering an emotional bond with, and love for nature. There are many creative ways to achieve this, but it can include talking about, and reflecting on your feelings about nature. Helping people find wonder in nature, the joy and calm it can bring. Simply highlighting the pleasure people find in nature, rather than the setting out the facts and figures. 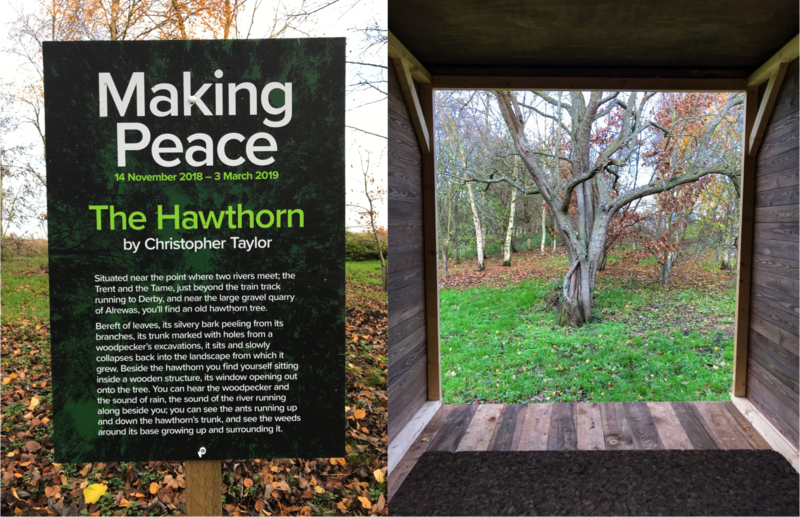 Further guidance comes from our work into what people find to be the ‘good things in nature’ – the sensations, changes over the seasons. changing weather, active wildlife, colours and beauty. 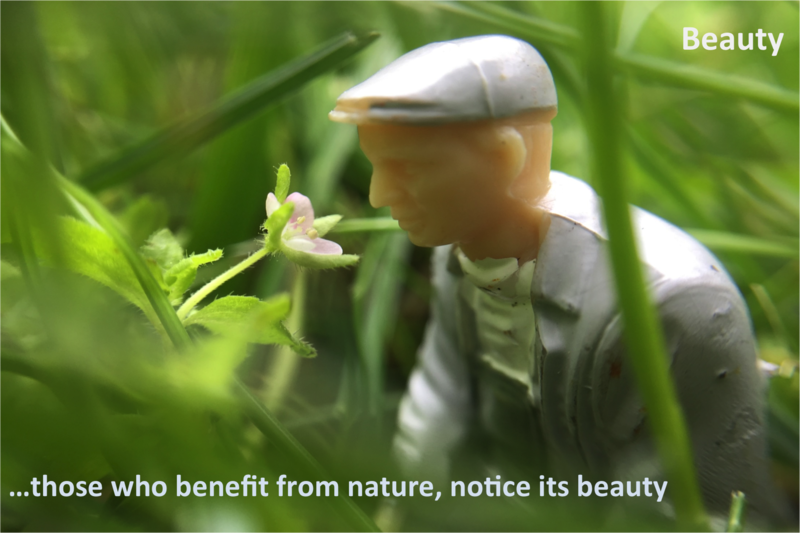 Beauty – activities that engage people with the aesthetic qualities of nature. Appreciating natural scenery or simply noting the beauty of a beetle before labelling it – trying to capture nature’s beauty through art or in words. Research shows that the wellbeing benefits of nature connectedness are significant for those people attuned and engaged with nature’s beauty. Gregory Bateson noted that when finding meaning were engaged in thinking that is most in tune with nature – metaphor is the language of relationships, the language of nature. 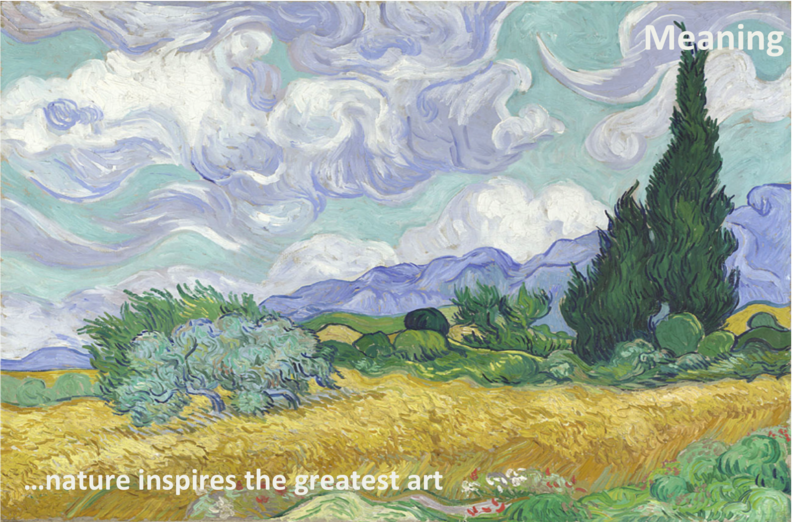 Meaning can include the properties of a place, natural symbolism to represent an idea and the signs of nature. Meaning can pull together the other pathways – birdsong is what emotions sound like. Prompt people to consider what nature means to them. 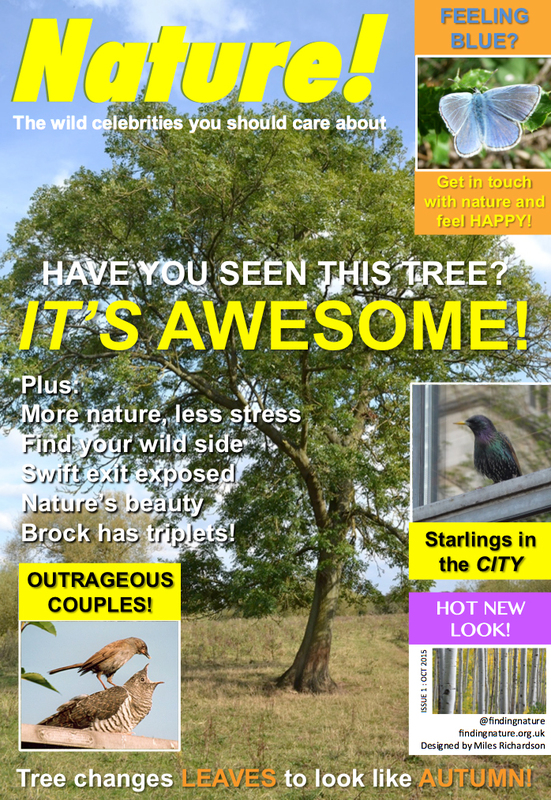 What’s their favourite local tree & why? Compassion – when connected to nature our sense of self can be extended to include nature. This leads to a moral and ethical concern for nature as harming nature is harming ourselves. Compassion can range from making ethical product choices to being directly concerned with animal welfare. Prompt people to consider what they could do for nature. 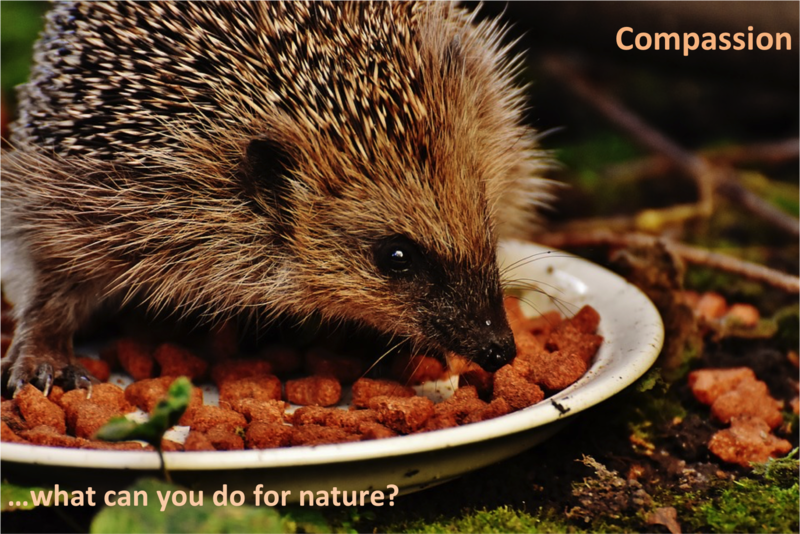 Why not make a home for nature? Missing from the pathways is one of the main relationships we try to foster with nature – facts, figures, identification and knowledge. 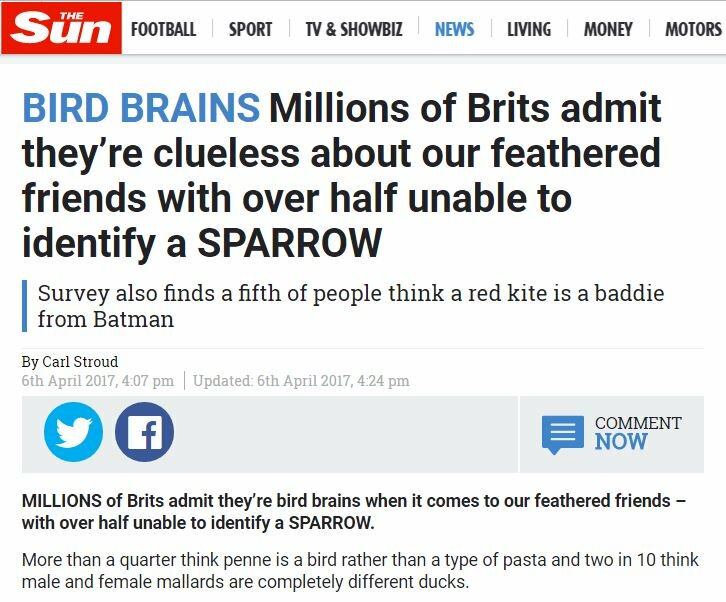 This can be difficult for some to accept – not being able to identify birds and trees makes national headlines! 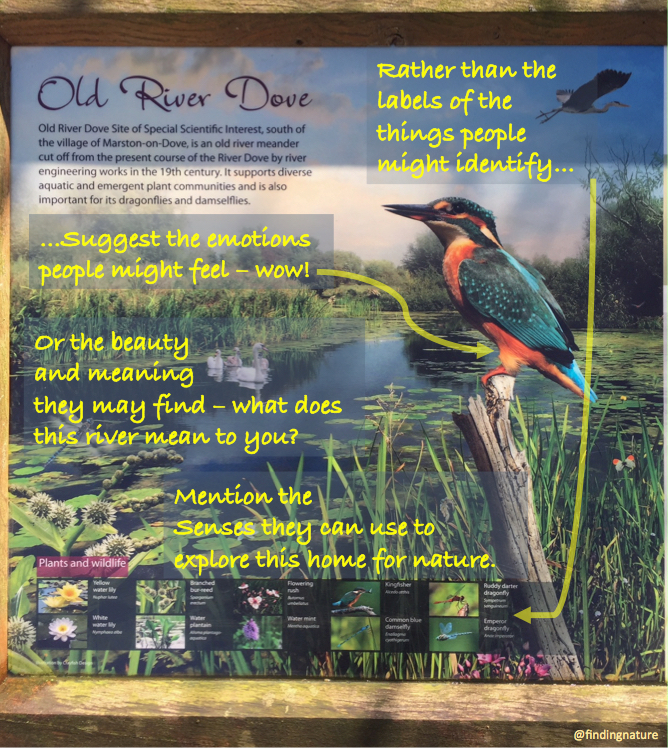 ‘Interpretation panels’ typical aren’t about interpretation, they present facts, figures and science. What types of lasting relationships are based on facts and figures? It should come as no surprise that a closer, healthier and sustainable relationship with nature comes through noticing, emotion, finding beauty and meaning, compassion. What types of lasting relationships are based on facts and figures? Creating habitats for connection – So rather than describe what a blackbird looks like, highlight the joy in listening to its song. Rather than explain how to identify a tree by its leaves, prompt people to watch how the breeze moves them. Rather than recording and ticking off species, watch them going about their lives. Rather than conquering the outdoors, find awe and wonder in being there. Make contact, reflect and experience emotion, meaning and the beauty of nature – pause – joy in the perception of the world. A prompt to pause, lie back and watch the canopy. Our work with the National Trust has been applied to a refresh of their ’50 Things’ campaign, applying the pathways has seen the dominionistic ‘climb a tree’ become ‘Get to know a tree’ – children can still climb a tree, but a broader range of activities will be given in order to develop a more meaningful relationship with nature. We should not forget that nature is AMAZING — we have to remind ourselves at every opportunity what is wonderful, meaningful, beautiful about the natural world and what we can do to support it. Richardson, M., & McEwan, K. (2018). 30 Days Wild and the relationships between engagement with nature’s beauty, nature connectedness and well-being. Frontiers in Psychology, 9, 1500. Richardson, M., McEwan, K., & Garip, G. (2018). 30 Days Wild: who benefits most?. Journal of Public Mental Health, 17(3), 95-104. Richardson, M. (2018). Growing our care for nature. National Trust. Lumber, R., Richardson, M., & Sheffield, D. (2017). Beyond knowing nature: Contact, emotion, compassion, meaning, and beauty are pathways to nature connection. PLoS One, 12(5). Richardson, M. & Sheffield, D. (2017). Three good things in nature: Noticing nearby nature brings sustained increases in connection with nature. Psyecology, 8(1), 1-32. Hi you know we used these in Encountering the Unexpected project- if not Ivan send on the publication next week. Nope, didn’t know that, be great to see the publication.